Chesapeake Bay Foundation: What Are Oysters Hiding??? How much do you know about oysters?! The Chesapeake Bay Foundation’s Oyster Restoration project has been one of Orvis’ Customer Matching Grants for the past two years. Oysters are pretty remarkable little rascals who have more talents than most of us realize! Tateer Tot is a complex combination of hard-working hero and mischievous boy. McHenry, Illinois—Jim and his Bloodhound, Tater Tot, have been volunteering with Wisconsin Search & Rescue Dogs tracking team to track missing people and find human remains since. . . Welcome to another edition of our nearly-weekly trivia challenge, in which we test your knowledge of all things fly fishing and where you might learn a thing or two about this sport we love. This. . .
Yeah, I know: they’re commercials. But our friends at The New Fly Fisher have a great eye for incredible scenery and wonderful fly-fishing action. If you love huge brook trout, you get an. . .
Schoolie stripers offered a great morning’s enjoyment for this Westerner. Longtime client John Kern from Salt Lake City joined me on the Kennebec for a morning of striped-bass fly fishing. We had a dropping tide, as we headed out at 5:30 a.m., and as we rounded. . .
Charlene and Joseph Handrick started with ten dog, which is a lot, but not unheard of. But by the time authorities raided their home on June 3, there were an astounding 276 dogs on the. . . These fish are hard to fool and tough to land. 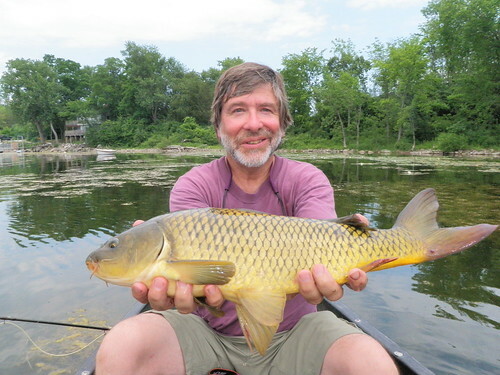 In the Facebook comments below last night’s post “How to Fish Wet Flies and Nymphs, with Tom Rosenbauer,” reader Jett Morris asked for similar information about carp fishing. So here’s. . .
Here’s a full episode of “The Orvis Guide to Fly Fishing,” in which Tom Rosenbauer covers the basics of using wet flies and nymphs to catch trout. From fly selection to presentation options, . . . There is nothing like a fresh rod set-up and some small-stream wild trout to break it in. This is a bittersweet post for me, as this was my last trip fishing the Arizona small creeks as a resident of the state. The time has come to relocate my family to Michigan, where we have. . . The Bonefish Bitters was Shawn’s secret weapon for the day. There are few things in life more enjoyable than a hall pass, a gorgeous summer day, and a plan to explore new water relatively close to home. Last Friday, Shawn “Diddy” Combs, our head. . .